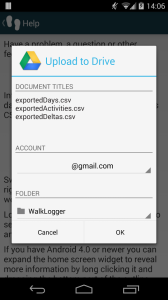 WalkLogger 1.7.X and newer allow you to export your activity data as csv files to view and analyze them on your computer. (There is currently no way to import these files back into WalkLogger.) 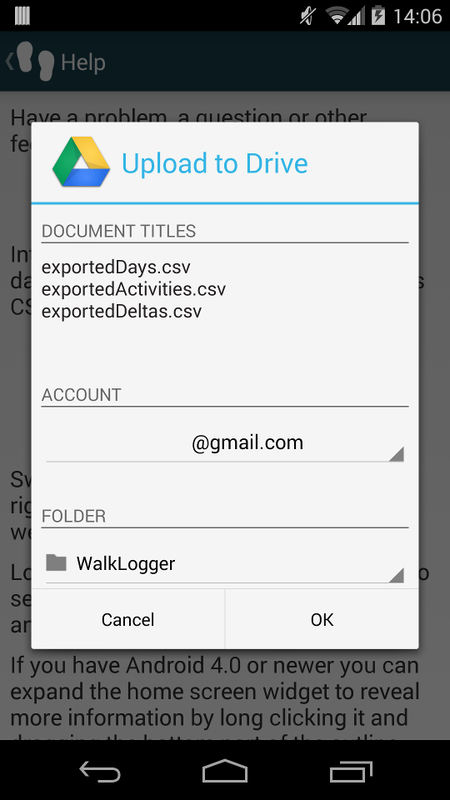 There are three files: Days, Activities and Deltas. The Days file contains your daily totals including steps, estimated distance, calories, etc for each day that you have used WalkLogger. 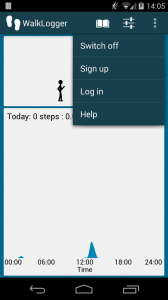 The Activites file contains activity totals, both for manually recorded activities and for automatically recorded activities. The Deltas file contains delta steps, and estimated delta distances, delta calories, etc recorded at approximately 5 minute intervals. 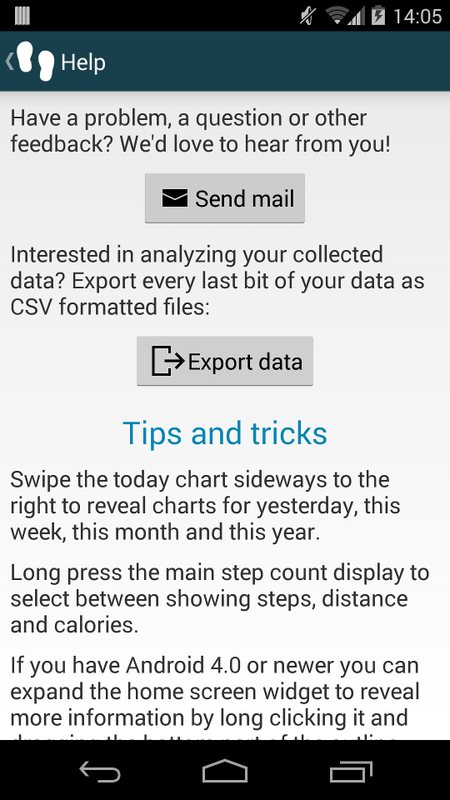 To export your data, first open WalkLogger. Open the menu and select Help. 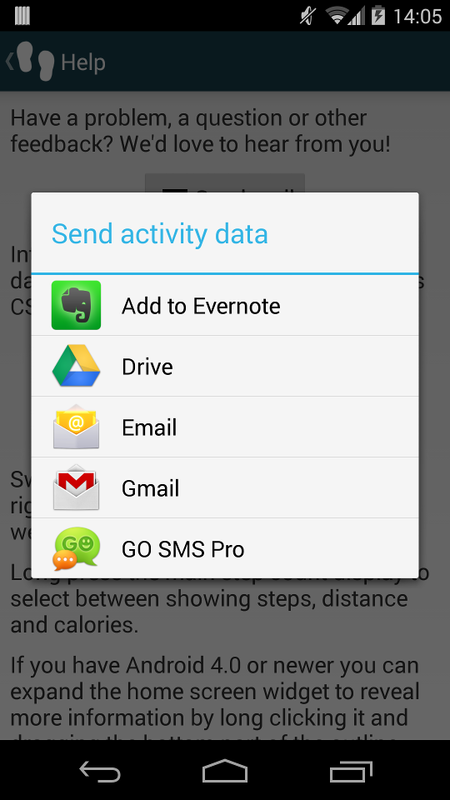 Tap the “Export data” button and wait for the “Send activity data” dialog to pop up. 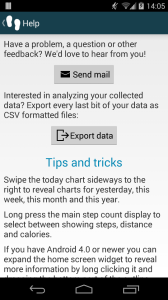 From the send activity data dialog, select the app that you want to use to export your data. The export feature has been tested with Gmail and Google Drive, but other apps that can receive and send files may also work. 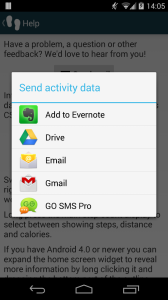 If you use Gmail an email will be created with the files attached as attachments. You can send this email to yourself, then log in to your Gmail on your computer and download the files from the email that you sent to yourself. If you use Google Drive the files will be uploaded to your Drive where you can access them from your computer.